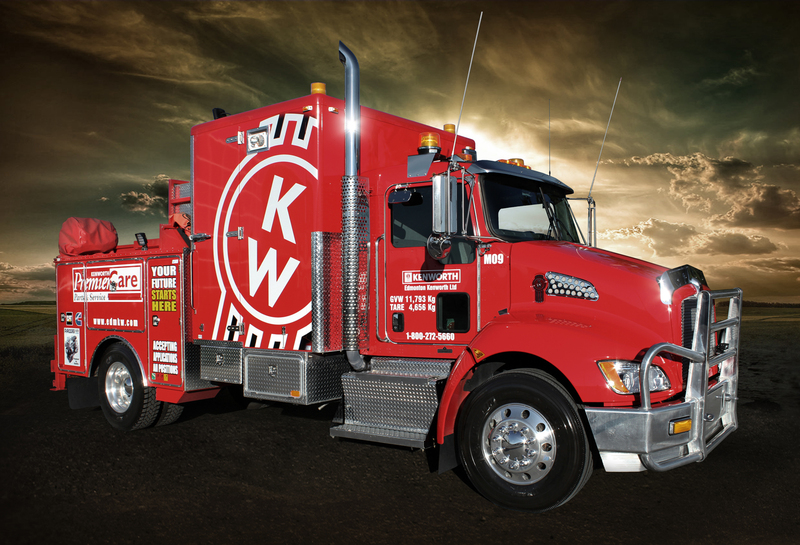 Ten Kenworth Service Truck Vehicles Ready to Serve You! That’s right – TEN service trucks! We have a fleet of service trucks, and they are not your everyday run of the mill pickup trucks with work bodies on the back, we use Kenworths for our service trucks. These heavy duty Kenworth T300 trucks allow us to carry more tools, equipment and parts into the field to get your truck fixed and get you on your way faster. Our service trucks can handle almost any emergency repair in the field including engine work, suspension work, transmission and clutch work, air conditioning work and electrical work and they are available on-call 24 hours a day, 7 days a week. We Arrive Well Equipped To Handle Almost Any Situation! Each one of our service trucks are equipped with an arc welder, an air arc welder, a tig welder, a mini crane, an air conditioning recharge station, an air compressor, a generator and a computer for engine diagnostics on PACCAR MX, CAT and Cummins engines as well as computer controlled drivetrain components and ABS brakes.